And For My Next Trick, I’ll Need A Blow Torch And A Banana Peel! OMG that meme. I can’t stop laughing. 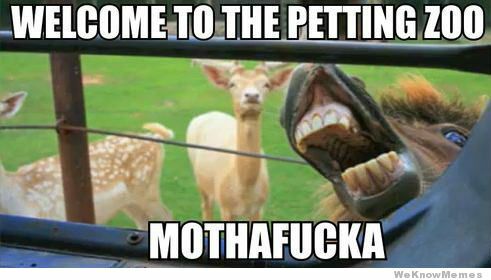 I don’t why I think animals saying MothaFuka is so funny BUT I DO! Can we please back up and question why you are taking your kid’s to the racetrack to bet on horses? Because I’m gonna find that way more interesting than a plastic bag. whoops – got cut off there. Going to the racetrack with your mom and grandma might make you the coolest kid in the world. At the dog track, I always bet on the dog that poops during the walk to the gate. It has to be faster with less weight. Please, please never let my sons find that out. I won’t tell… Except that I sorta already did, and really it’s only likely to become a thing if your kids get really bored in a place where there are a lot of horse-turds lying around. Signs are definitely how you read them. As for horses, one should feed them beans before a race to get the best advantage from the jet propulsion unit. Also works for half my class before PE! I would have taken it as a sign to bring another bag and bet on which one would win the race around the lot. But that’s me. Your son would be complaining up a storm about the apartment house I lived at in the Valley (Providence). If there was any trash left on the road within 6 blocks of the place, the wind would guarantee it ending up in that yard within the day. You were in the vortex! Ohhhhh, I want some Wellies.